Mumbaikars aren't strangers to Belgian patisseries, the most recent entry being that of Le Pain Quotidien. 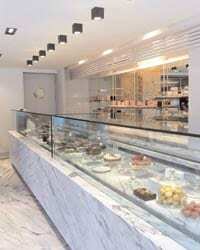 But the arrival of renowned pastry chain, Debailleul, has put Mumbai firmly on the patisserie map. This is the brand's first outlet in India, close on the heels of its European and Japanese successes. Like all its stores, the goodies here arrive every 15 days after being shock frozen in the Brussels kitchen. Be it the chocolate, macaroon, brioche or croissant, each tastes as fresh as the day it was made. The chocolates though, are clearly the fastest selling. Dark, milk, or white, either pure or with nuts or fresh fruit, it's all there. Each piece is about an inch long and tastes of sinfully-rich Ghanaian cocoa. The passion fruit pate in dark chocolate and the heart-shaped, milk and allnut chocolate are must-haves as is the chocolate with wild truffle oil. Another one you cannot miss is the white chocolate with an image of the pattiserie's founder Chef Marc Debailleul drawn on it. Amazingly, these images are not stamped but hand-drawn with edible paint. The desserts are beautifully displayed next to the chocolate. There isn't a lot of variety, but what is available is clearly part of a wellthought out list. The frambiose tart is fresh and delicious; the ideal dessert to end the day. Another favourite is the surprisingly sweet lemon tart. and the Galloway- a small but filling pink mound similar to a cheesecake, with layers of blueberries and assorted red berries. Pair that with the light and fleeting flavours of a raspberry sorbet and it's a winner. Macaroons for Rs 91; chocolate from 95; desserts for Rs 500; breads Rs 90 onwards & hot chocolate & other hot drinks from Rs 90. Address: Emca Sadan, Appasaheb Marate Road, Prabhadevi, Mumbai - 400025; Tel: (0) 9619487395. Mezzaluna, a fine-dining restaurant at Movenpick hotel, Bangalore, is as instantly Italian as the kitchen tool for which it is named. Italian food is undoubtedly one of India's most popular foreign cuisines, second only perhaps to 'Indianised' Chinese. The newest on the block to capitalise on our love for all things Italian is Mezzaluna, at the recently launched Movenpick Hotel and Spa in Bangalore. Flanked by a large, open kitchen on one side, the interiors are traditional with wooden tones and warm colours. Careful thought has been given to the ambience. From the chessboard tiles on the floor, to the pots and pans hanging around the kitchen, you really do feel like you've turned up at an Italian home. Italians tend to avoid overly complicated cooking. This love for simplicity comes across while eating at Mezzaluna. My evening starts with a crisp white wine that goes well with the insalata caprina, a salad made with arugula, avocado, goat cheese, pine nuts and sundried tomatoes. For the antipasto, I am served a beautifully done Norwegian smoked salmon tartare with mousse. The fish simply crumbles in the mouth, while the mousse adds just the right amount of acidity. Next comes the black mussels and clams sautÃƒÂ©ed with garlic in a light tomato sauce. It's a classic dish and I am glad to mention that the expat Italian chef at Mezzaluna faithfully reproduces flavours of his country's kitchen. The restaurant has an exhaustive menu with numerous options for vegetarians as well. For ravioli fans, the half-moon shaped lobster ravioli in a green pea sauce is a good main to try. The light, fragrant sauce is the winner in this dish. For the entree, I have char-grilled tenderloin with a gorgonzola sauce and fresh polenta. Sadly, it came to the table cold and ended up being a disappointment. I end my meal with a delightful Movenpick sorbet that comes with a selection of fresh fruits. So, while Italian cuisine is fairly readily available in India, what sets Mezzaluna apart is its unobtrusive service and charming authenticity. Meal for two: Rs 4,200 onwards with a bottle of wine. 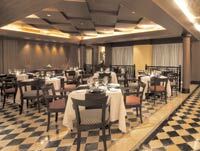 Address: Movenpick Hotel & Spa Bangalore, 115 Pipeline Road, Bangalore, Tel: 080 4300 1000.